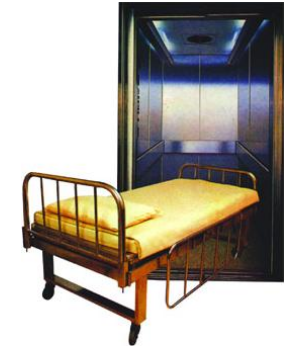 Stretcher elevators,are used in hospitals and are capable of at least one stretcher to carry one companion. In general, for the comfort of the patient in terms of lighting and aesthetics are designed with the latest technology. To prevent the entry and exit of the elevator during the backboard stretcher floors cabin setting precision is set to shake. Lift rate, considering the importance of time for doctors and patients, should be set so as to minimize the time spent in the elevator. Inside Patient elevators also known as stretcher lifts, anti-bacterial measures should be taken and stainless materials should be selected for the importance of hygiene & health of the patient. It also must prevent power outages. In Stretcher elevators, variety of features are implemented such as width of the doors are designed as usually wide with automatic functionality, frequenct control & various number of positions of buttons. Generally, these type of elevators have 1600 kg - 2500 kg carrying capacity and 0.40 m/s to 3 m/s speed. Fully automatic or center opening or cabinet door options, anti-bacterial floor, bringing systems and various control options such as emergency options. Elevators prices are effectively changed according to the selection of specific features. If you want vehicle elevators,request a offer from the companies by filling out the request form completely. In this way, you can get the best price deal from elevator companies according to your needs.